One of my interests is user experience design. User experience design is not only about the shape and look. Steve Jobs had a very famous quote concerning design and I believe that it is very true. It seems that not many companies understood this principle. One of these few companies that understood and followed this principle, in my opinion, is Dropbox. Dropbox has focused on a two points since it was launched. Ease of use and Working everywhere. You can now find dropbox clients almost for any platform you're working on. And Dropbox is dead simple to use. You don't have to learn or remember anything about it and this,in my opinion , is the secret sauce of Dropbox success. 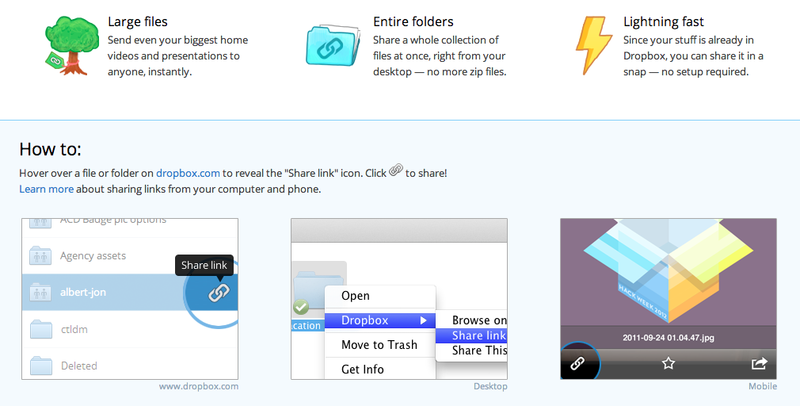 Recently I got email from Dropbox announcing a cool new feature which is Dropbox links. Now you can make links to files or folders in your Dropbox. Quickly share your photos, docs, and videos with friends and colleagues — even if they don't have Dropbox! Notice now how simple it is to share files and even complete folder to anyone. It's extremely simple. Dropbox UX Design team is genius, no doubt about it.